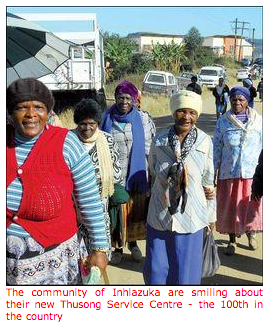 Gone are the days when the community of Inhlazuka in KwaZulu-Natal had to travel long distances to access government services. A new Thusong Service Centre - the 100th in the country - was opened at Inhlazuka by President Thabo Mbeki on 7 June. The centre, which is the 15th in KwaZulu-Natal, offers services from government departments like Home Affairs, Social Development, Education and Labour. There is also a SA Social Security Agency, a post office, and a library. Communities will also get training in new skills like computer literacy and how to use the Internet. An Information Technology (IT) training course will be offered thanks to a partnership between local businesses, IT experts and the University of KwaZulu-Natal. The Limpopo House of Traditional Leaders got 139 applications from traditional doctors to have initiation schools in the province. A total of 327 schools were registered in 2006; 43 of them were declared illegal. 40 314 young boys were initiated and at least 12 deaths were reported. In 2007, a total of 243 schools were registered and 32 300 boys were initiated. Seven illegal schools were reported and the number of deaths dropped to five. 8 583 units. This year, they will build another 1 677 houses through the People's Housing Process at a cost of R721 million. The People's Housing Process encourages people to build their own homes by starting housing co-operatives. A further 500 houses will be built in the province through the Rural Housing Programme at a cost of R23 million. Thanks to the Department of Land Affairs, the community of Bakwena-ba-Mogopa ba Bethani have recently returned to the land where they were born. They were removed from the land by the previous government. They are now encouraged and supported to use the land for farming since food production is the best way of fighting poverty and rising food prices. The Department of Home Affairs' campaign "ID Yourself" kicked off in Elliot in June. This means young people across the country can now start looking out for the Home Affairs mobile trucks which will be visiting their schools in the coming months. The campaign aims to raise awareness of the importance of having an ID document. It encourages young people, especially those in Grades 10 to 12 to apply for ID documents. In June, the province's Department of Agriculture and Land Affairs started a development programme encouraging youth to get involved in farming and rural development to help them get out of poverty. The programme, called Youth in Agriculture and Rural Development (YARD), aims to promote and improve the participation of youth in the farming sector. It will also start programmes to promote and develop t farming and rural development skills among the youth. The new Lufhereng Mixed Income Housing Development Project in Soweto will provide 25 000 houses to residents in the area. The project will include RDP houses for the poorest of the poor, affordable housing for other low-income households, as well as middle to high income housing. It is the biggest project ever to be undertaken by the Gauteng Department of Housing and the City of Johannesburg.